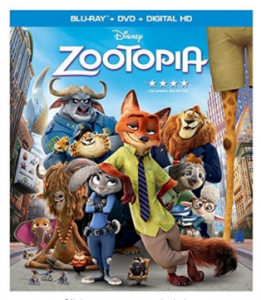 Pre-order Zootopia (BD/DVD/Digital HD) now for $24.96 (reg.39.99)!!! Pre-order your copy of Zootopia on Amazon now for just $24.96 (reg. $39.99) !!! You Receive the lowest price if the Amazon.com price drops between your order time and the end of the day of the release date! FREE Two-Day Shipping is available with Amazon Prime. From Walt Disney Animation Studios comes a comedy-adventure set in the modern mammal metropolis of Zootopia. Determined to prove herself, Officer Judy Hopps, the first bunny on Zootopia s police force, jumps at the chance to crack her first case even if it means partnering with scam-artist fox Nick Wilde to solve the mystery. Bring home this hilarious adventure full of action, heart and tons of bonus extras that take you deeper into the world of Zootopia. It s big fun for all shapes and species!